As usual, we've a variety of new goodies in store these past few weeks. This antique pine wall shelf came out of an old Queenslander, if you look at the back you can see it has been cut to fit a wall with a horizontal beam. 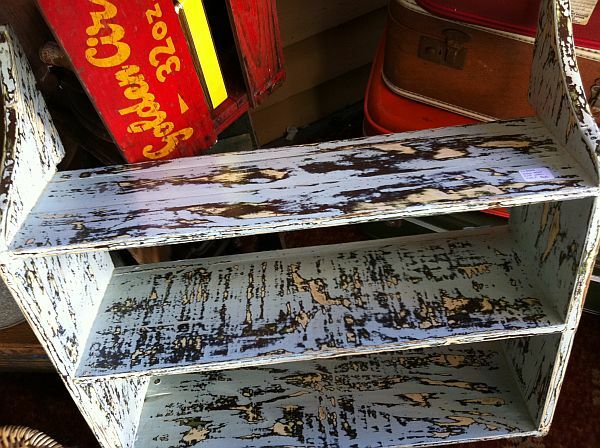 I was lucky to find 4 layers of old paint underneath, perfect for the shabby look everyone seems to love right now. 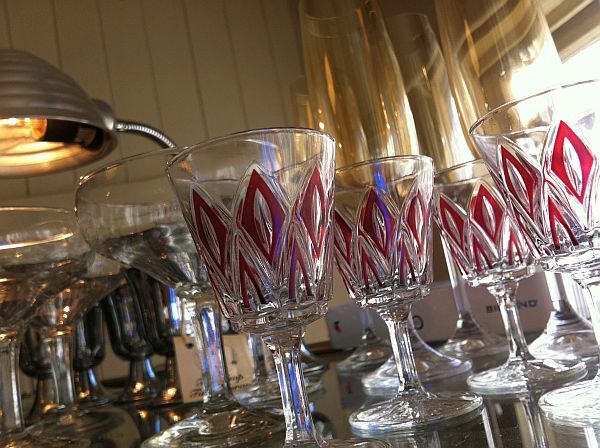 Lots of new glassware, including vintage champagne saucers, something that seems to be in demand lately. 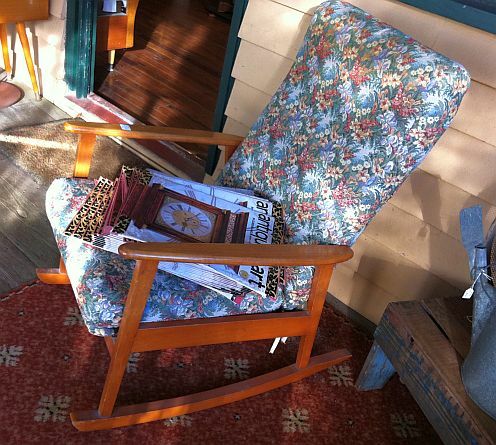 1960s tapestry rocking chair, something that the many retirees on the mountain may remember from their childhoods. Dodgy lighting courtesy of the sun! 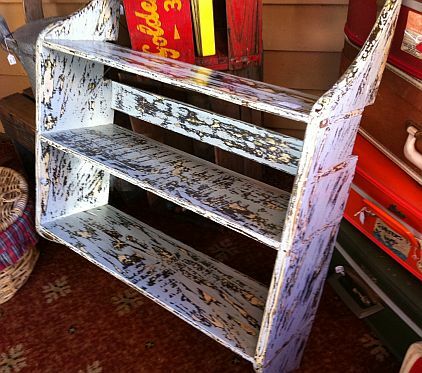 My latest shabby masterpiece (I'm allowed to call them that when they take a stupid amount of work, right?! 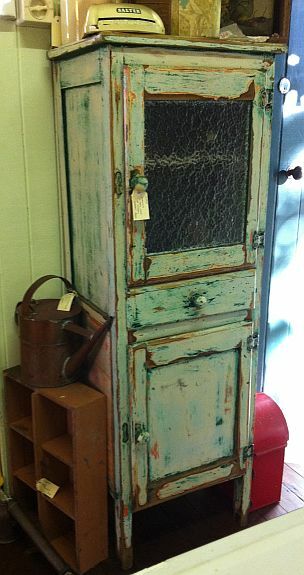 ), a fab antique pine slimline kitchen dresser. It was a disgusting school-underpants-forest-green when we got it, with cracked white 1980s plastic handles on it, ugh, but look what I found underneath and did with some wooden handles Sue found. Bangles and hair flowers now making an appearance. Lots of new fashion coming in too, this 50s dress and jacket set is so twee but very cute, the jacket closes down the back, so not something you can don without help! 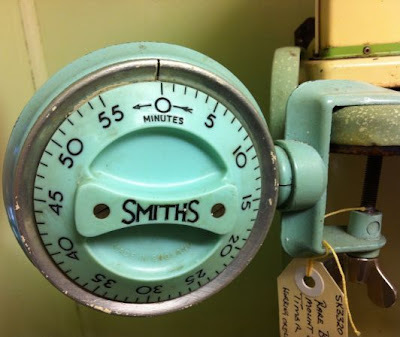 Rare green bakelite Smiths kitchen timer, as you can see this one is made to clip on to the old enamel stoves. 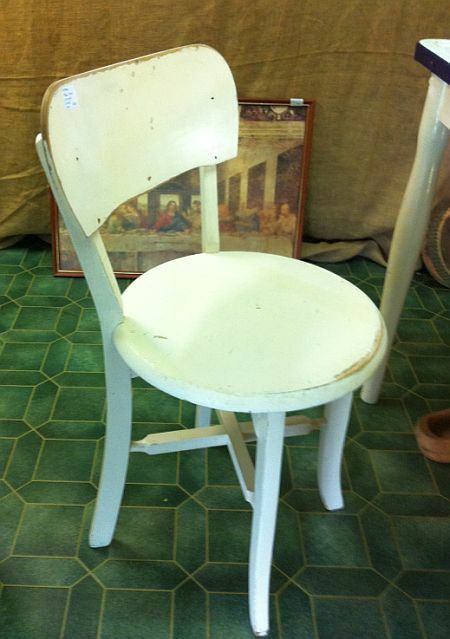 Pair of 30s/40s bentwood style chairs, straight into the kitchen as they go so well with the enamel-topped table. 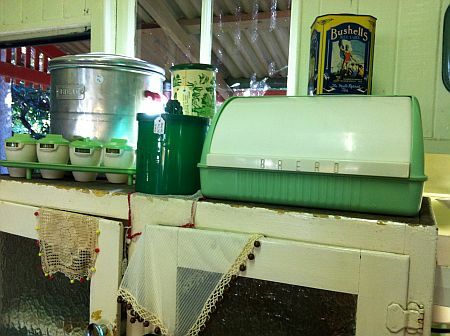 And for all you green-in-the-kitchen fans, there's always plenty in our shop, how fab is this bakelite bread bin?! 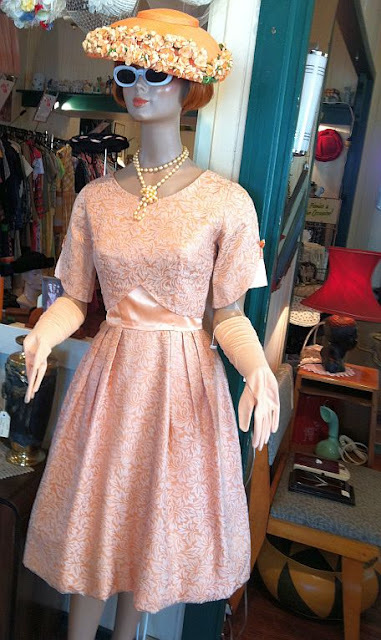 The pink dress is divine! The timer is adorable and the shelf and kitchen unit so very much worth the effort. Fun post to peek in on today. 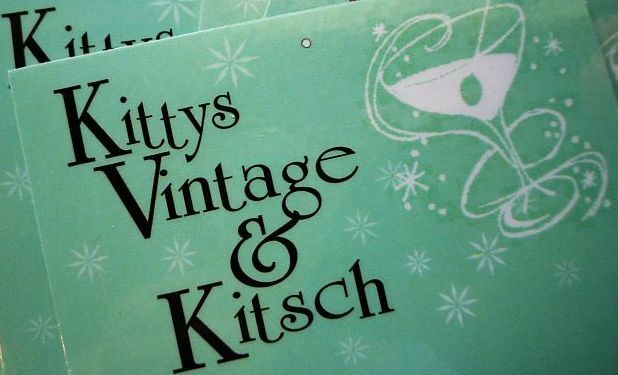 your shop looks awesome, too bad I live on the other side of the world! 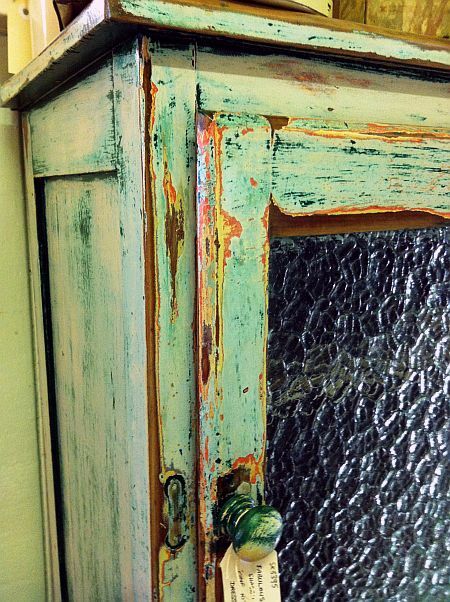 Love all the green and am painting my kitchen green in the next couple of days. Especially the pink dress an flowery hat. 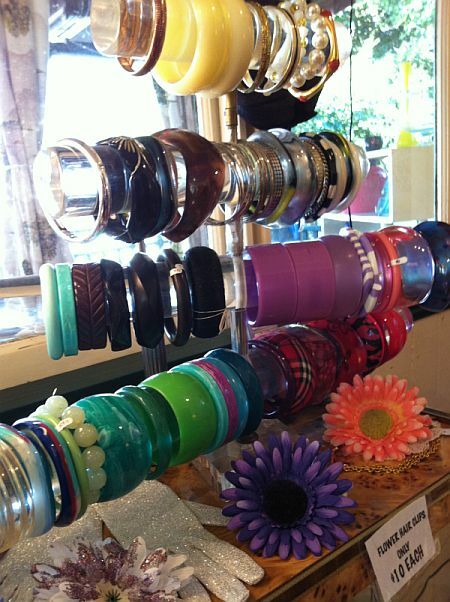 Look at all those lovely bangles! I need to find me a bangle holder like that one. Wow all of these items are right up my alley.....LOVE LOVE LOVE! Oh my goodness the timer is amazing!!!!! I love miss pretty pink, so lovely.